"Good evening ladies and gentlemen. 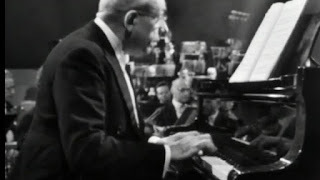 I wanted to share with you a few thoughts, perhaps insights into this unique work which you are about to hear - the Concerto in d minor for two pianos by Francis Poulenc. At the end of the 19th century the musical scene in Europe was dominated by the music of Wagner and Strauss. This rich, lush, self-indulgent, self-oriented music completely overwhelmed and overshadowed anything in its way. Composers such as Stravinsky, Ravel and Debussy had to look elsewhere for their sources of inspiration. They tried to break away and go as far as possible from this intoxicating, somewhat "dangerous" music. Stravinsky started to incorporate African rhythms into his compositions. Ravel looked to Persia and being fascinated by the new cultural possibilities wrote Scheherazade. Debussy went even further, off the coast of Indonesia to the island of Java and brought back the sounds of Gamelan music - an orchestra of bells. The search for new sounds - exoticism - was central especially to the French composers. Francis Poulenc was born into this atmosphere in 1899. Absorbing these new waves and musical thoughts, he also raised an important question - whether music / art has to always represent something serious, above, high, elitist. Can music, at times, be just plain silly. This concerto is in d minor. The two most famous d minor concerti are those by Mozart and Brahms. Both are profound masterpieces with monumental as well as tragic substance. The piece which we are about to hear, although in the same key, is a complete antithesis to its predecessors. It might be looked at as a counter-reaction to everything that d minor represents. This is music that combines buffoonery with brilliance; elements of fear with elements of flirt. It will make you love as well as laugh. It is sophisticated and surprising. It is very moving music, as well as movie music. Ladies and gentlemen, you are right! Combining all these things together might end up sounding more like one big cacophony than a piece of music. Well, we thank you for coming. We wish you good luck, and hope that you will enjoy this evening’s performance."